The Oil Bull Market — AK provides some color on the oil rebound we’ve been tracking. Hedge Fund Letters — Our 10 favorite hedge fund letters for sourcing equity picks. Japanese Equities Awaken — The Nikkei is ripping. We explain why the run is just getting started. Pseudonymous blogger, Jesse Livermore, put out a fascinating piece on how to calculate and think about likely expected market returns. Everything Jesse pens is a must-read and this piece is no different. His ability to ruthlessly dissect common assumptions with razor sharp logic is unmatched — I’d love to know who he really is. 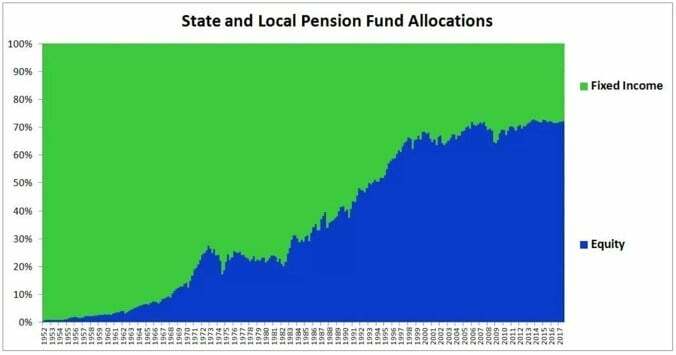 In the post, Jesse discusses how the average U.S. pension fund is working off assumptions of 7.5% annual returns. These are optimistic expectations for the low interest rate environment we’re in, especially when combined with the fact that equity valuations are in the 97th percentile of all valuations in history (so, pretty high). Read the whole thing, you’ll learn something. Here’s the link. For example, in a world of 12% inflation a business earning 20% on equity (which very few manage consistently to do) and distributing it all to individuals in the 50% bracket is chewing up their real capital, not enhancing it. (Half of the 20% will go for income tax; the remaining 10% leaves the owners of the business with only 98% of the purchasing power they possessed at the start of the year – even though they have not spent a penny of their “earnings”). The investors in this bracket would actually be better off with a combination of stable prices and corporate earnings on equity capital of only a few per cent. With the turning of the long-term debt cycle and the increasing rise of populist politics around the world, it’s odds on that the next secular cycle will be inflationary. It’s good to start studying the specific dynamics of inflationary market regimes and this doc isn’t a bad place to start. Here’s the link. Also, here’s FT’s Matt Klein’s conspiratorial take on the recent sell-off in crypto (hint: it’s to hurt the North Korean regime). Link here. And finally, here’s Horizon Kinetic’s 4th quarter portfolio update. Some good stuff in there. This week I had to go back into the archives of my podcasts rotation because I’d listened to all the new ones. I’m so glad I did because I rediscovered an old (2016) Barry Ritholtz MiB interview with investing legend, Bill Miller. It’s one of the best interviews I’ve heard in a long time. I actually listened to it twice this week because there’s just so many good takeaways in it. After an incredible 15+ run of consistently beating the market, making him one of the all-time great money managers, Miller took one on the chin in the financial crises and had to temporarily close up shop. But he’s back at it again, and doing really well. I’m a big fan of the way he thinks about investing and markets. He’s a former military intelligence specialist, like myself, which shows in the way he approaches things. I’m a regular reader of his funds blog (link here) which is worth checking out. Anyways, here’s the link to the episode. Listen to it, it’s good. And side note: I’m thinking about writing a Lessons from a Trading Great piece on Miller soon. So if you’ve got any articles, interviews, books etc… that include him, please shoot them my way. It’d be much appreciated. This week I took a break from market related books and instead revisited some classics. I read Helen Keller’s The Story of My Life which is a fantastically beautiful and inspiring book. I think I last read it in grade school and I’m so glad I came across it again. She was a gifted writer and thinker and her life story really forces you to put your own personal trials into perspective. I also read a compilation of Will Durant’s essays titled The Greatest Minds. Will Durant, and his wife Ariel, are two of my favorite historians. They have a gift for sussing out the major threads that tie history together. They’re also skilled writers with the ability to make their words spring to life. If you haven’t read the book The Lessons of History, you need to. It’s one of my all-time favorites. Anyways, The Greatest Minds… like all their work, was great. It’s a short and fun read. Finally, I’m just cracking open Profits and The Future of American Society by Jay and David Levy. The son and grandson of Jerome Levy, founder of the Jerome Levy Forecasting Institute. The book was recommended to me by a friend. It covers Levy’s economic theory which he called the private enterprise system. I’ll share my thoughts on the book, next week when I’m finished. I forget, but I wanna say the chart below is from a report by JPMorgan. 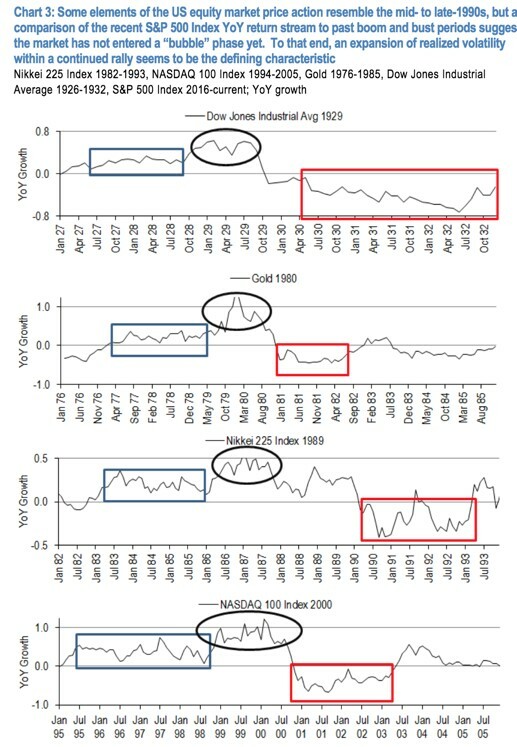 It shows that for the current market to truly enter “bubble” territory, as marked by historical instances, we would need to see realized volatility expand along with a continued rally higher. This fits with Granthams “melt-up” thesis and is inline with our current thinking on where things may be headed. I’m keeping a close eye on precious metals/miners. 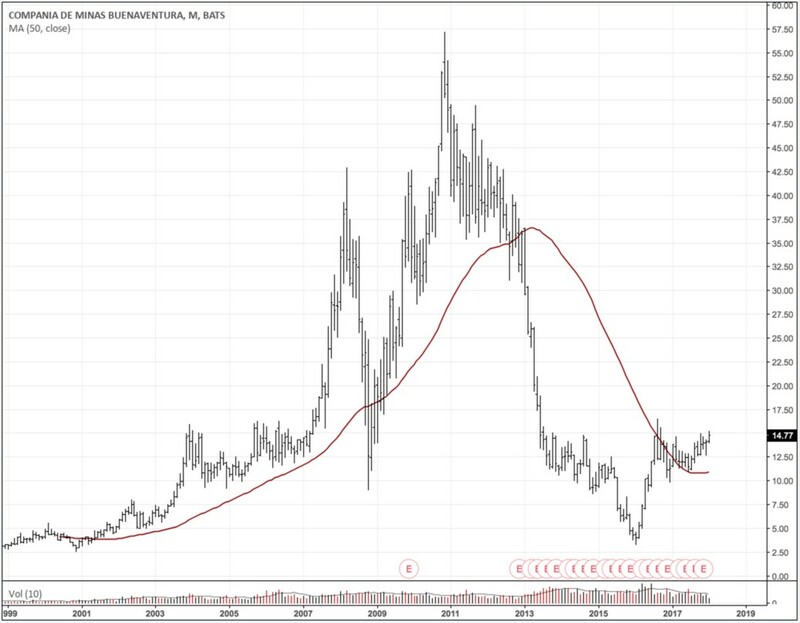 The charts for gold miners are setting up nicely, like this one below of BVN (monthly). Gold is an important macro instrument to watch because it’s reflective of the fundamental global demand for USD based liquidity. And because of this, it often leads the dollar at key turning points. So if gold is able to make a decisive and sustained break higher from here, then that would be a bearish signal for the dollar. Of course, a lower dollar is positive for gold, which is part of the circular causation mechanism that makes markets so complex. I’m agnostic at the moment and can see gold, and the dollar, going either way. But it won’t be much longer before the market tips its hand. And then I think we’ll see the beginnings of what will be a large trend and profitable trade for those paying attention.